The rivalry between the University of Georgia and Georgia Institute of Technology is over 106 years old. As the last season game of the year for both teams, it is one that has encompassed the lives of many dedicated fans. The Thanksgiving season just would not be the same without it, for it is history that is sure to take place for millennia to come. Because of the strong ties this rivalry holds, I looked into the life of a former and special Georgia Bulldog, who is sure to become an asset to the Georgia Tech Yellow Jackets in 2016. That student-athlete is JJ Green. JJ Green began his football career in 2002 in Woodbine, Georgia. The first ever team he played for was known as the Woodbine Pirates, and ironically, their colors were red and black. As a 7 year old, he was not sure what his athletic future would hold. His drive and love for the sport compelled him to set goals for himself. As an eighth grader, he was set on playing varsity football, and he made this happen. By the time he got to high school, his goals had grown even bigger. After establishing this fact, his heart was set on becoming a Texas Longhorn. This team was easily his favorite growing up; however once they started losing consistently, he ironically became a Florida Gators fan. His top 3 schools outside of Georgia included Stanford, Duke, and either Vanderbilt or Tech. He received several educated offers because he could actually get accepted into these schools with his good test scores and could also play the sport exceptionally well. Although he was excited to collect these offers and Duke was his very first one, he committed to Georgia on April 9, 2012. In fact, he was at UGA on National Signing Day because he graduated high school early in order to get a jump on school and the playbook. 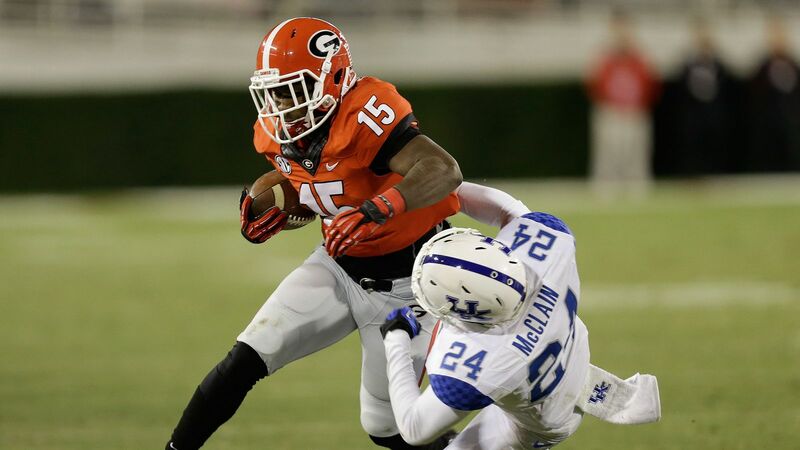 He came to UGA knowing he would be at running back, and as a true freshman, that is exactly what he did. He contributed to the Bulldog Nation as a considerable addition, and the fans absolutely fell in love with him as an athlete. “I felt like I was the man on top of the world,” said Green. His position changed to defensive back going into the spring of 2014. Green was initially enthusiastic about this position change because he felt he would be better at defensive back; however he was not because running the ball has always been within his athletic niche. Without a doubt, this position is where his heart is and that is exactly why he made the move to Georgia Tech despite the history of the rivalry. Although fans expressed harsh feelings toward the student-athlete, he made sure to keep his transfer within his own reasonable perspective. His old teammates wish him the best of luck in his future, and his new teammates have welcomed him with open arms.